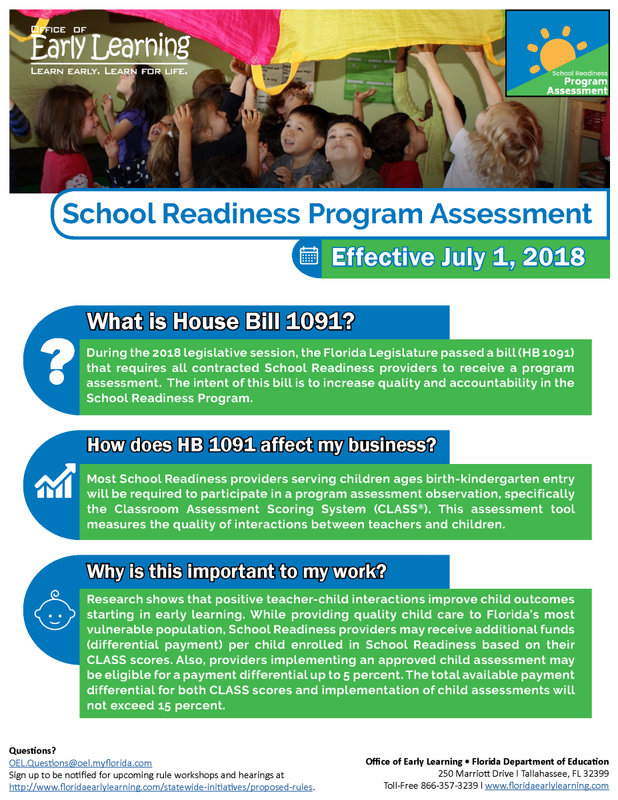 The Florida legislature recently passed House Bill 1091 that requires School Readiness providers to have a Program Assessment using the CLASS® tool to contract with the Early Learning Coalition for 2019-2020. This includes existing providers who are renewing their contracts, as well as, new providers. To receive a Program Assessment, providers are required to register all instructors and classrooms into the Florida Office of Early Learning (OEL) School Readiness Program Assessment system. Providers who do not complete the registration process will not be eligible to enter into a School Readiness contract or participate in the School Readiness program for 2019-2020. All providers need to register immediately, no later than March 1st, 2019. Please visit https://earlylearningpfp.fldoe.org in order to complete the registration process. OEL Provider ID number (EFS ID) and Department of Children and Families' License or License Exempt number is needed to register. If you need help with the registration process, please contact the Assessment Manager, Vittoria DeCaria-Chirighin at (561) 846-0822 or email vittoria.chirighin@elcpalmbeach.org. This excludes CURRENT Performance Funding Project (PFP) Participants. Need help completing your School Readiness Program Assessment Registration online? COME SIT WITH US! If you have not registered for the School Readiness Program Assessment and you would like to request for your staff a FREE year subscription to the myTeachstone Learning Reasource, please 'COME SIT WITH US' and we will guide you step-by-step through the process. Session 2: 6:00 p.m. – 7:30 p.m. Required of all licensed and license-exempt providers. Inspections completed by DCF or the local licensing authority. Program assessment required for providers serving children birth to kindergarten entry. 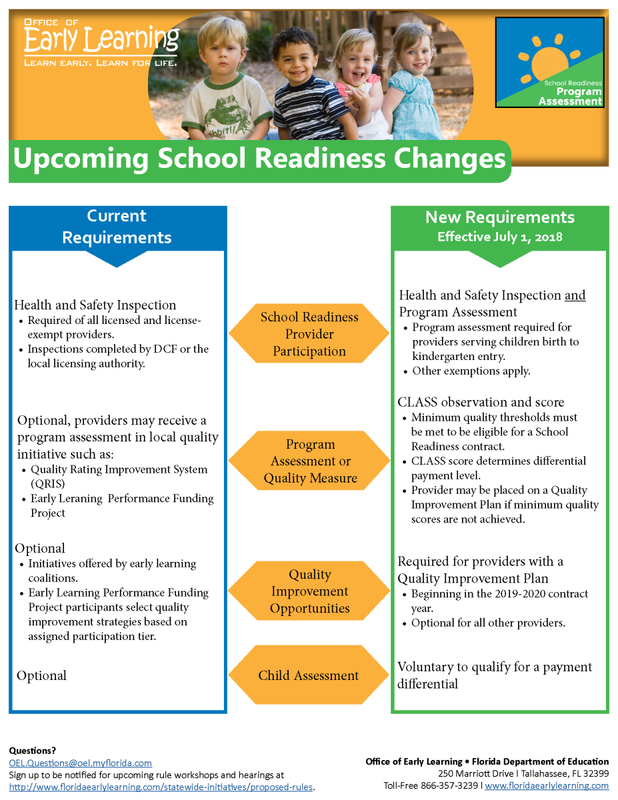 Minimum quality thresholds must be met to be eligible for a School Readiness contract. 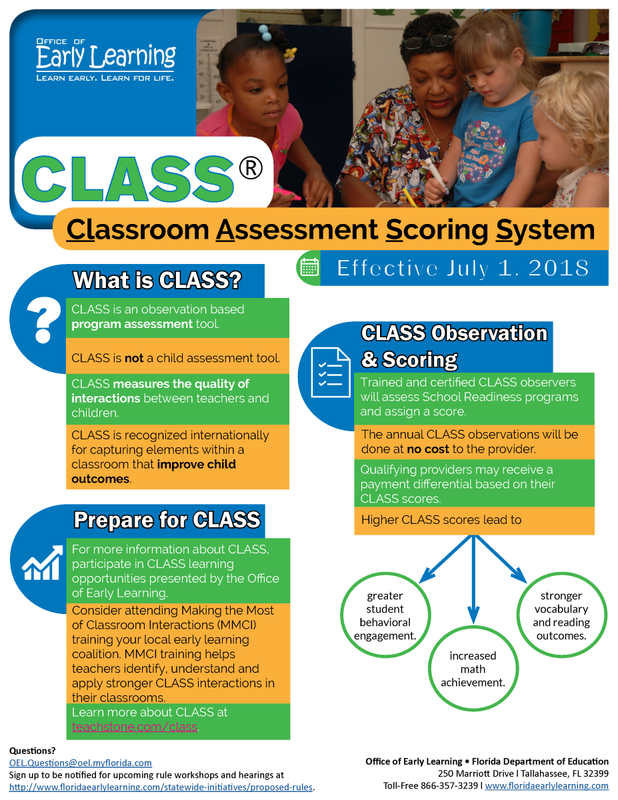 CLASS score determines differential payment level. Provider may be placed on a Quality Improvement Plan if minimum quality scores are not achieved. Initiatives offered by early learning coalitions. Early Learning Performance Funding Project participants select quality improvement strategies based on assigned participation tier. Beginning in the 2019-2020 contract year. Optional for all other providers.